Shannon grew up in Marshfield, MA. She received her Bachelor’s degree in Kinesiology, from the University of Massachusetts, Amherst. Shannon then went on to pursue her dream of becoming a physical therapist and earned her Doctorate of Physical Therapy from Boston University. 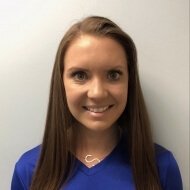 Shannon’s clinical experience includes working with a variety of patient populations in multiple outpatient orthopedic settings as well as sub-acute rehab. Shannon first came to BSPT as a student on a clinical affiliation and knew this was where she wanted to be after graduation. Shannon is one of our aquatic therapists. She combines aquatic and land therapy to help her patients attain their fullest potential. In her free time Shannon enjoys traveling, going to the beach and spending time outside with her Bernedoodle!